Cinnamon was one of the first trade spices of the ancient world. Biblical references indicate that merchants carried the Asian spice all the way from Ceylon to Palestine – that’s a 24-hour airplane trip today – before the pyramids were built. The English word cinnamon derives from the Hebrew word kannamon, and the spice is mentioned in Psalms, Proverbs, Ezekiel, and Revelations. Moses, the patriarch of patriarchs, commanded the children of Israel to anoint the tabernacle, the vessels of the tabernacle, and the priests themselves with ointments made of cinnamon. Let’s remember that the stuff was hauled from beyond India without the help of jet engines, and the Phoenicians and Arabians who hauled it weren’t working for peanuts. Why did Moses specify cinnamon and others pay the price it cost? Because it was, and still is, special. There is something about cinnamon that made it worth any expense. Moses was not cinnamon’s first admirer, and many others were to follow, agreeing that it was the superlative body splash and more. The ancients Theophrastus, Herodotus, Galen, Dioscorides, Pliny, and Strabo all mention it. Cinnamon ranked in value with gold, ivory, and frankincense, and was among the most costly offerings in the temple of Apollo in Miletus in 243 BC The early Egyptians used cinnamon in their embalming mixtures, and Chinese medicinal use of the spice dates back 4,700 years. The Arabians discovered that when you boil out the oils contained in a plant, those oils purvey the scent of said plant, be it roses or cinnamon, and so they imported cinnamon from the Orient, distilled the fragrant oil out, and sold the more easily transported substance to the Europeans. In this form, the spice made its way from Arabia to Venice, and from Venice to all points in Europe. If cinnamon sticks were special, cinnamon oil was considered a bonus deluxe. Cinnamon is the bark and twigs of a number of related plants that have one thing in common: cinnamon oil. The plant rarely reaches higher than 30 feet; the leaves are deep green and the blossoms usually white. Once the trees are six or seven years old, the bark is peeled off into so-called cinnamon sticks. Ground into powder, they yield what we find in cans on the grocer’s shelf. Aside from a great tasting dusting for doughnuts, we don’t see cinnamon as being very special any more. This is unfortunate. Cinnamon is one of the oldest tonic plants on the globe. The world may not agree politically, but in the realm of tonics, all acknowledge that cinnamon is good for health. The Chinese feel that cinnamon used on a daily basis over a long period of time will improve the complexion, giving the taker a more robust, stronger, and more youthful appearance. One Chinese ancient said that if you took cinnamon with toads’ brains for seven years, you would be able to walk on water, look young forever, and never die. While you may have a problem getting your hands on a pound of toads’ brains, the active ingredient, cinnamon, is readily available. Where there’s smoke, there’s fire, and behind most folk tales, there’s some measure of truth. The daily use of cinnamon could well improve your health. The Chinese believe that cinnamon heats up a cold body, improves the circulation, and generally gets the blood rushing around, stoking up the waning fire, if you will, and they prescribe it for loss of vigour, whether due to stress, ageing, or illness. They believe the spice warms the kidneys and cures impotence, weak legs, and backache. Specifically, cinnamon is held supreme for blood deficiencies that leave one feeling weak. In India, cinnamon is used to flavour sweet treats, but every villager also knows that chewing on the cinnamon stick is a powerful treatment for the monthlies. The spice, which stimulates the uterine muscles, is also used in difficult deliveries due to inadequate contractions. A painkiller as well as a uterine stimulant, cinnamon is essentially the herbal equivalent of many over-the-counter menstrual medications. The Chinese, who along with other Asians use it as a treatment for PMS, agree that cinnamon promotes regular and easy menstruation. Did you ever notice that after eating a cinnamon-powdered doughnut you couldn’t help but love the whole world? And you thought it was your blood sugar reaching an acceptable level! Cinnamon has been used as a tranquilliser since before Western civilisation became civilised (that is to say if it ever did). The source of this sedative effect is the cinnamaldehyde contained in cinnamon powder and, more powerfully, in cinnamon oil, which has been proven to tranquillise both animals and human beings. In some interesting Chinese research, scientists discovered that they were able to neutralise the effects of phenobarbital and methamphetamine in mice with a matching dose of cinnamaldehyde. The same chemical was found to relieve pain in mice. Since overcharged nerves do present a threat to life and, as they say, stress kills, a hot cup of relaxing cinnamon tea may be just what the herbalist ordered. The folk treatment for bronchial asthma in various parts of Asia, this same cinnamon tea has been found by researchers to stop most sufferers’ attacks. More and more, asthma is being linked to emotional upset, and the calming nature of the substance may be at the root of this cure. In days gone by and even today, a high fever can be the end of you – if nothing else, elevated body temperature can make you feel out of whack. One of the Chinese treatments for fever is a dose of cinnamon, and indeed, research has shown that after being injected with salmonella and typhoid, mice, the poor creatures, had a reduction in temperature when treated with cinnamaldehyde. This may be due to cinnamon’s ability to open up the blood vessels. Scientific validation aside, the news to you is that if you have a fever, cinnamon is likely to reduce it. The world we live in is filled with disease. Let’s face it, everywhere you look you see people sneezing and coughing, and usually on you. When you only get two weeks off a year, who wants to spend that precious time in bed watching reruns? The main folk use of cinnamon has been fighting infection, and following the custom of taking it after exposure to an illness in the aim of not getting sick yourself might not be a bad idea. Here are some facts, not theories, facts. Cinnamon oil has exhibited antifungal, antiviral, bactericidal, and larvicidal activities. Specifically, ingredients in cinnamon kill escherichia coli, staphylococcus aureus, salmonella, the Asian flu virus A, and echo virus. What does this mean? These are all nasty bacteria that can make you exceptionally ill. Salmonella causes food poisoning, escherichia coli causes Montezuma’s revenge, and staphylococcus aureus causes lesions, pustules, and boils that can be terminal if they spread to the organs. Not a pretty picture, but the good news is that cinnamon has been proven to suppress their growth, and the growth of several other gram-positive bacteria. Not surprisingly, the folk belief that cinnamon can stop bacteria, fungus, and viruses from attacking food or persons is absolutely true. From now on, whenever you come in contact with snot-nosed children harbouring all of the above, have yourself a cup of hot cinnamon tea. Could there be more from this all-in-one pharmacy plant? Yes. “For pe stomak. Dis driep vp pe ille humoure of pe stomak, and hit comfortep it and strength it.” A Middle English translation of a famous Latin herbal called Macer Floridus de viribus herbarum, written somewhere around the ninth century, asserts in its easy-to-read style that cinnamon gets rid of bad things that hang out in the stomach, calms it down, and makes it stronger. As a stomach remedy, cinnamon hails supreme, and Macer’s claim is actually quite in keeping with the research done of late. If your stomach is upset by a bug of sorts, cinnamon will kill it (the bug). If your stomach is all in a knot, cinnamon will relax it. People in the ninth century knew more about cinnamon than we do! And we think of ourselves as so worldly. You know where to get cinnamon. 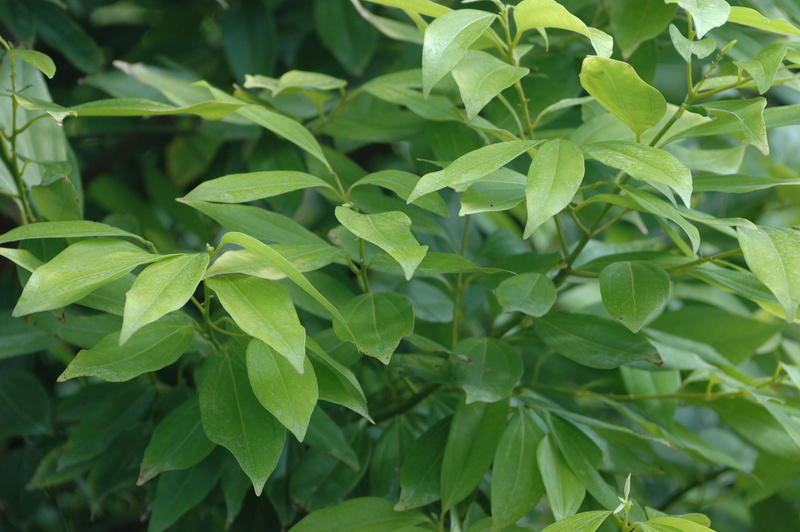 The plant isn’t grown much in the United States, although several locales would suit it fine. A hot-weather plant, it would have to be grown in a greenhouse or in the sunnier parts of the country. Though the plant isn’t especially appropriate for the garden, ground cinnamon and cinnamon sticks are easy to find in any grocery or health food store. An herbal hint – the best cinnamon comes from the Chinese pharmacist. The extra-good news is that unlike many of our tonic plants, this one actually tastes nice and adds a pleasant flavour to a home-made cure-all. Reasonable Uses: general tonic, excessive menstrual bleeding, heavy menstrual bleeds of menopause, gum bleeding, excessive mucous production(digestive, respiratory, urinary), diarrhea, food poisoning, digestive flu, digestive upset while traveling abroad. For the Asians, cinnamon is a native plant and one they have used for a long time. The Chinese have been pulling the bark of this moderately sized tree and using it medicinally for 4,700 years! Today, it is still one of the most commonly used herbs in China. Chinese herbalists believe that the daily use of cinnamon makes one look and feel younger. It is seen as one of the best vitality stimulating herbal medicines available. It history does not stop in Asia. It was hauled from Sri Lanka to Israel in Moses’s day for use in the Temple in Jerusalem! That was just the beginning of western cinnamon use! In the last century cinnamon was used by doctors to stop uterine bleeding after child birth, during menstruation, and after miscarriage. Doctors found it stoppped secretion, whethre blood from the uterus or mucous from the nose. Cinnamon contains a wild cocktail of health stimulating compounds including tannins, essential oils, and saponins. These compounds work in unison to improve general health, explaining its reputation of being a longevity plant. Cinnamon is famous for being able to dry secretions, menstrual bleeding, excessive mucous production, and diarrhea included. This is due to the essential oil which gives cinnamon its characteristic smell and the tannins which give it its characteristic color. Both stop secretions flowing. A cup of cinnamon tea will reduce menstrual blood flow! Long used to treat diarrhea and other digestive dramas caused by micro-critters, Cinnamon bark contains an oily chemical called cinnamaldehyde that kills a variety of illness-causing bacteria, including the dreaded Escherichia coli, Salmonella, and Staphylococcus aureus. Cinnamon clears the symptom of digestive upset, i.e. diarrhea, and the root of the problem! International business and leisure travel has become an everyday affair. Unfortunately, our digestive tracts do not respond positively to the unfamiliar bacteria encountered whilst abroad. Take a daily dose of cinnamon to avoid Montezuma’s revenge or Dehli Belly! When food poisoning hits, diarrhea can cause dangerous dehydration. To quickly dry up the flow, use cinnamon tea. Cinnamon is a natural astringent and will dry up your bowel very quickly. Cinnamon bark checks menstrual flooding. This can be used for the occasional heavy bleeding or when the problem is chronic. If it’s a chronic problem, plan ahead. Start using cinnamon the morning your period starts and keep using it until it has passed completely. As a women’s reproductive years come to a close, menstruation can become scanty or heavy. Often this is a unpredictable affair. Cinnamon can be used to stop those heavy flows that appear out of nowhere. Ground cinnamon is sold at supermarkets everywhere, and cinnamon tincture is available at health food stores. Due to the stimulating oils it contains, it should not be used in medicinal amounts during pregnancy. If diarrhea continues for more than two days see your health care practitioner. If you experience bleeding between periods see your health care practitioner. Cinnamon was one of the first spices to be traded around the ancient world. Cinnamon comes from Asia , and yet gets a big write up in the Bible, which means that they had access to the spice from far off lands well before the Bible got written down, some 2500 years ago. It is mentioned in Psalms, Proverbs, Ezekiel, Revelations. The English word cinnamon derives from the Hebrew word kinamon. Let’s be clear on the reality of the fact the ancient Israelites had cinnamon to use in the household. Cinnamon traveled from Ceylon to Palestine , a 24 hour airplane flight, by camel, hoof, and foot, before the pyramids were built. Take a look at a globe, and picture human beings hauling the brown powder from point a to point b. Now that you appreciate the long haul, lets get into the Bible angle on it. Cinnamon doesn’t just get a light reference, it is listed as a really important spice. It’s mentioned in Exodus 30:23 “take thou also unto thee principal spices, of pure myrrh five hundred shekels, and of sweet cinnamon half so much, even two hundred and fifty shekels.” Moses, the patriarch of patriarchs commanded the children of Israel to anoint the tabernacle, the vessels of the tabernacle, and the priests themselves with ointments made of cinnamon. Let’s remember the stuff was hauled from beyond India without the help of jet engines, so a couple hundred pounds was worth more than a small fortune. The traders didn’t haul it all that way for charitable motives. The very chere substance was imported by the Phoenicians and the Arabians, and as I have said, it went over land from Asia . Why did Moses specify cinnamon and others pay the price it cost? Because it was and is special. There was something about it that made it worth whatever it cost. Moses was not cinnamon’s first admirer, and many more were to follow agreeing it was the superlative body splash and more. The ancient historians Theophrastus, Herodotus, Galen, Dioscorides, Pliny, and Strabo mention it. Cinnamon is mentioned as ranking in value with gold, ivory, and frankincense, and as being among the most costly of the offerings in the temple of Apollo in Miletus , 243 b.c. Get this, the branches with leaves were woven into wreaths to be used in the temples, much like laurel leaves. Not only did the ancient traders haul the cinnamon sticks, but branches with leaves attached. You know how hard it is to get a christmas tree from the living room to the trash can with the leaves attached, imagine if you had to haul it to Argentina on foot and keep enough leaves on it so it could be sold for wreaths. Unlike the wreaths people wear today at toga parties, the wreaths of the ancient temples were woven of plants thought to have magical and spiritual powers. Why did they bother? Because the ancients knew there was something really special about this plant. The spice is first mentioned in Chinese herbals from 2700 b.c. to 1200 b.c. This is as much as to say that the Chinese were using cinnamon in medicine 4700 years ago and they still do. Let’s just spend a minute thinking about a product that gets used for almost 5000 years, that’s some product support if you ask me. The Egyptians used cinnamon in their embalming mixtures to keep the bodies well preserved. Cinnamon has a secret ingrediant that made it perfect for people taxidermy, but you will have to read on to hear all about that. First of all, what is cinnamon? Cinnamon is the bark and twigs of a number of related plants, the plants all have one thing in common, the bark is filled with the characteristic cinnamon oil. The plant is a smallish one, rarely reaching higher than thirty feet, the leaves are deep green, the blossom usually white. Once the trees have reached an age of six or seven years, the bark is peeled off. These peelings are what we call cinnamon sticks, something we Americans only see floating around in hot cider or hot mulled wine. These sticks are ground to a powder, this powder being the cinnamon we see on the grocers shelf. And aside from a dust for doughnuts, we don’t see cinnamon as being very special anymore. Today we take fragrant oils rather for granted, not realizing that many of our foods are actually flavored with the distilled essences of plants. Cinnamon, being one of the most popular spices in antiquity, was one of the first plants to be distilled down to its essential oil. The Arabians discovered that you could boil out the scented oils contained in a plant, and that those oils would purvey the scent of said substance, be that of roses or cinnamon. It’s a lot easier to carry cinnamon oil than it is to carry the equivalent amount of cinnamon sticks. The Arabians imported cinnamon from the Orient, distilled the oil out, and sold the essential oil to the Europeans. The spices made their way from Arabia to Venice , and from Venice to all points in Europe . If cinnamon sticks were special, cinnamon oil was considered to be bonus deluxe special. People in days gone by found cinnamon so special or powerful, they felt it incredibly magical. This magic touch was felt around the globe, and in different parts the sticks were made into good luck and protection magic. Take for example around the bayou in the United States , home of hoodoo conjuring. In, Mules and Men, written in 1935, Nora Thurston puts down on paper the secrets of the bayou hoodoo doctors. Hoodoo is the Southern American version of voodoo, and at the turn of the century, the descendants of African spiritualists and doctors still practiced the art. The book is chock full of information on the practice, but here are two recipes for some power gotten from cinnamon. The hoodoo doctors were mixing up something to make a hex or take one off. Ok, so what makes cinnamon so special? True, it tastes great on a danish with a cup of coffee, but beyond this, it is a powerful health plant. It is one of the oldest tonic plants on the globe. Tonics you will recall are used to promote health, to keep illnesses away, and strengthen the body. The world may not agree on a political plane, but in the realm of tonics, all agree that cinnamon is good for health. Its special powers in maintaining health made people feel it was special. The Chinese feel that cinnamon if used for a long period time, consistently, like every day, will improve the complexion, giving the taker a more robust, strong, and young appearance. A Chinese ancient said that if cinnamon was taken with toads brains for seven years, one would be able to walk on water, look young forever, and never die. There is a problem getting your hands on a pound of toads brains, ask your local butcher. I don’t think he will be able to help you. Fortunately, the active ingrediant is cinnamon, which is readily available. In another Chinese document a rather interested story is told. The hero of the story is Chao the Hunchback, what his last name was or where he lived wasn’t mentioned in the story, so that part will have to remain a mystery. Anyhow, our friend Chao is said to have taken cinnamon for twenty years in a row, and aside from the fact he grew hair on the bottom of his feet, he was said to have been rendered unnaturally strong. As the story goes, he was able to walk five hundred li (200 miles) in a day and lift a weight of one thousand chin (1333 pounds) with his bare hands. As they say, where there is smoke there is fire, and behind most folk tales, is some measure of truth. I wouldn’t start looking for a razor for the soles of your feet, or try to jack your car up with your bare hands, but the daily use of cinnamon might improve your health. The Chinese say that cinnamon heats up a cold body. Their idea is that people with cold extremities have bad circulation, and cinnamon is said to get the blood rushing around, heating everything up. Cinnamon as a strengthener is held as such any way you travel around the globe. Back to Zora Neale Thurston’s book on the bayou ways. Here’s a recipe for a general tonic that was thought to be priming. The Chinese are quite focused on plants that fire up the waning fire if you will, being quite knowledgeable as to what should be used in the case of loss of vigor. This loss of energy could be due to stress, aging, or illness, no matter what the cause, cinnamon is one of the answers, specifically cassia cinnamon or canella as it is called in Latin American groceries. The Chinese feel it warms the kidneys, fortifies the animal component in all people, curing impotence, weak legs, and backache. Specifically, they say it is supreme for deficient blood that leads to one feeling weak. Surprisingly enough, cinnamon, usually seen in dashes on top of rice pudding, is one of Asia ‘s more popular PMS treatments. Being a man I cannot estimate what it would be like to be afflicted with difficult menstruations, but from all accounts, it is needless to say, a pain in the behind. Suffer no more, or so say our Asian brethren. In India the cinnamon is also used to flavor sweat treats, but every villager knows that chewing on the cinnamon stick is a powerful treatment for the monthlies. The spice stimulates the uterine muscles, assisting in getting menstruation over. The same is used in difficult deliveries due to inadequate contractions. Cinnamon is a pain killer as well as a uterine stimulant, the combination essentially the herbal equivalent of many over the counter menstrual medications. The Chinese state that cinnamon improves circulation which promotes regular and easy menstruation. What your are looking at is a quote from a middle English translation of a very famous Latin herbal written somewhere between 849 and 1112 a.d. The name of the herbal was Macer Floridus de viribus herbarum. The original was written in Latin, then translated into middle English several hundred years later. Several hundred years even later, I will translate the line for you, “cinnamon eaten or drunken helps the liver and speeds menstruation and makes it pass quickly.” The message here is that in 8th century Europe people knew that cinnamon was good for a bad case of PMS, which could lead to the loss of life, perhaps not yours, but somebodies. How did we loose track of the simplest remedy yet, who knows? Did you ever notice after a cinnamon powdered doughnut you couldn’t help but love the whole world, and you thought it was your blood sugar reaching an acceptable level. How wrong you were. Cinnamon has been used as a tranquilizer prior to Western civilization becoming civilized, that is to say it ever did. The culprit of this relaxation or sedation, is the Cinnamaldehyde contained in the cinnamon powder and in a major way in cinnamon oil. The oil has been proven to tranquilize animals, including humanoids. In some interesting Chinese research, scientists found they were able to neutralize the effects of phenobarbital and methamphetamine in mice with a matching dose of cinnamaldehyde. The same chemical was found to relieve pain in mice, and in that they can’t talk, I’m afraid to know how that was determined. Overcharged nerves do present a threat to life, as they say, stress kills. A hot cup of relaxing cinnamon tea at the moments you experience the most stress may be just what the herbalist ordered. The folk treatment for bronchial asthma in various parts of Asia has been this same cinnamon tea, researchers have noted this does, in fact, stop the attacks in most sufferers. More and more asthma is being linked to emotional upset, and the relaxing nature of the substance may be at the root of this cure. In days gone by and even today, a high fever can be the end of you, and if nothing else, an elevated body temperature can make you feel out of whack. One of the Chinese treatments for fever is a dose of cinnamon. Research has shown that mice, poor creatures, when injected with salmonella and typhoid had a reduction in temperature when treated with cinnamaldehyde, that cooky active ingrediant in cinnamon. The reduction in temperature may be due to cinnamon’s ability to open up the blood vessels. The scientific validation aside, the news to you is that if you have a fever, cinnamon is likely to reduce it. In fact, cinnamon lowered the body temperature of mice not injected with the infectious diseases! Cinnamon can be found as a folk treatment for problems with the circulation, and blood, a very important element in our lives, is indeed something we want to keep circulating. Back to the Chinese, research has shown that cinnamon reduces adrenal hypertension in rats, so rats aren’t people, but close in more than one case. The world we live in is filled with disease, let’s face it, everywhere you look you see disease, people sneezing and coughing, and usually on you. No one has ever has time to get sick, and with the schedules we keep we generally have less time than in times gone by. In a world where you get two weeks off a year, who wants to spend that precious time in bed watching reruns? The main folk usage of cinnamon has been fighting infection, and an old custom of taken it after having been exposed to an illness in the aim of avoiding getting it yourself, may not be a bad one. Not surprisingly, the folk usage of cinnamon to stop bacteria, fungus, and virus from attacking food or persons is precisely what it does. From now on, when in contact with snot-nosed children harboring all of the above, have yourself a cup of hot cinnamon tea. Could there be more from this, all in one pharmacy plant? Yes. “For pe stomak. Dis driep vp pe ille humoure of pe stomak, and hit comfortep it and strength it.” You guessed it, good old Macer in his easy to read style says cinnamon gets rid of bad things that hang out in the stomach, calms the stomach down, and makes it stronger. As a stomach remedy cinnamon hails supreme, and Macers claim above is actually quite in keeping with the research done of late. If your stomach is upset by a bug of sorts, cinnamon will kill it (the bug). If your stomach is all in a knot, cinnamon will relax it. People in the eighth century knew more about cinnamon than we do! And we like to think of ourselves as so worldly. And you know where to get cinnamon. The plant isn’t grown much in the states, though several locales would suit it just fine. It is a hot weather plant, and would have to be grown in a greenhouse or in the sunny parts of the country. Though the plant isn’t terribly applicable for the garden, the extra good news is that unlike many of our tonic plants, this one actually tastes nice and will add a pleasant taste to our homemade cure all. Cinnamon is a fast growing tree native to tropical Asia. Its leaves, bark, and roots are filled with aromatic oils which give it the characteristic cinnamon smell. These same oils act as bug killers to a wide array of dangerous bacteria, virus, and fungus that cause human disease. When you brush into the tree, you smell cinnamon. Cinnamon bark is the part used both in medicine and cuisine, and its a classic food-medicine. Long used to correct digestive infections, its addition to food may have originally been a way to keep the digestive tract free of dangerous infections. The bark contains oils that act as anti-microbials and mucilage that absorbs fluid, stopping diarrhea and soothing upset digestive tissues.